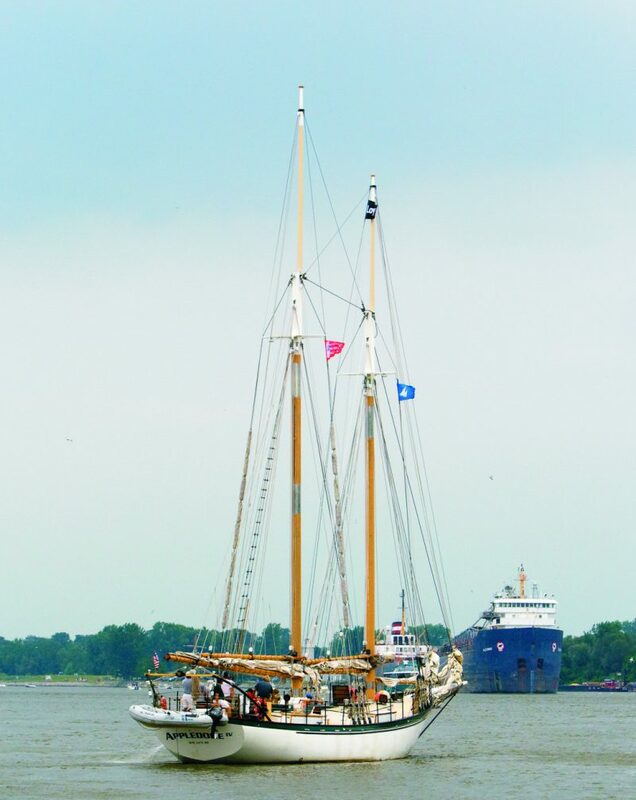 Gougeon Brothers, Inc. has supported our local tallships—Appledore IV and Appledore V—since they arrived at their downtown Bay City facilities on the Saginaw River. These steel-hulled, gaff-rigged schooners are typical of the type that sailed the Great Lakes and coastal waters right up to the end of the age of sail. Schooners were the primary means of transporting goods and people over long distances. 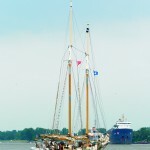 The larger Appledore IV, originally commissioned by Herb and Doris Smith in 1989, was the fourth in a series of schooners built for world voyaging and purchased by the non-profit organization BaySail in 1997. Gougeon Brothers has also supported our local community sailing association which shares dock space with the Appledore IV for the summer. We have developed great friendships and cooperative working relationships with both organizations, and this is where this story begins. Bill Bauer heads the Saginaw Bay Community Sailing Association (SBCSA) Boatbuilding class located in the GBI boathouse loft. He has led the building of a Shellback dinghy (named Applecore, hence the title reference) and a Rangley 15 for the Appledores. Roger Nugent is the Executive Director of BaySail. He approached Bill with an idea for modifying the rigging blocks for easier replacement. It was a great idea, and the only catch was that because the Appledores are commercial vessels, they’re subject to USCG inspection and requirements. Both Roger and BaySail Director Kevin Dykema (an SBCSA Boatbuilding class alumni) wanted the concept to be tested and validated to prepare Baysail with proper documentation in case the Coast Guard asked for information about the new block set up. Both Appledores utilize traditional black locust deadeye rigging blocks for the standing rigging. Traditional in this case means the blocks were carved from a single piece of wood. The ½” steel rigging cable is wrapped around the block and the wire crimped in place. Roger wanted the blocks assembled in two pieces so the main body of the block assembly could be inserted through the cable and then attached the retaining flange using epoxy. This would allow the blocks to be replaced without having to deal with disassembling the cable rigging and re-crimping the new blocks in place. Bauer presented Roger’s idea to our Chief Testing Engineer Bill Bertelsen, and asked him to quantify the load carrying capability of the two-part block assembly. (There are way too many Bill’s around here!) Bertelsen said “sure” and Bauer set off to fabricate a test block using G/flex® 650 as the adhesive. Bauer built a two-piece deadeye block and then fabricated a test sample that could be mounted into Bertelsen’s trusty MTS servo-hydraulic test frame with the same rope cordage and wire rigging as used on the Appledores. Figure 2 shows the test sample loaded into the MTS fixture prior to initial load testing. The “experimental” deadeye block is on top. The program started with a 100 lbf (pounds of force) pre-load on the assembly to get the parts settled in place. The load was then increased 1,000 lbf/minute to 5,000 lbf and held at that load for one minute while continuing to take data on load and actuator position every five seconds. The load was then ramped down at the same rate. Although the rope did stretch some, there was not a catastrophic failure-despite doubling the stated working load of the cable. Good data to be sure, but a single static pull hardly represents how this assembly will perform in the real world. 1. A manual ramp up to 2000 lbf in 500 lbf steps to take out the slack. The actuator was then set to 0 with a 100 lbf load applied. 2. An auto ramp to 2000 lbf and back. The actuator was again set to 0 with a 100 lbf load applied. 3. An auto ramp to 5000 lbf and back. This time the load came back to 100 lbf but the actuator position was not reset to 0 in order to indicate how much permanent stretch there was after the 5000 lbf load-a value of 0.9025″. 4. Sinusoidal tension fatigue test, cycling at 0.05 Hz between 1000 lbf and 5000 lbf. At 0.05 Hz it takes 20 seconds to complete each load cycle. Figure 3 is a screen shot of MTS graphical display of sinusoidal tension fatigue. The red trace is the applied tensile force in lbf; the blue trace is the actuator displacement in inches. The test ended at 401 cycles after 2 hours 13 minutes when the actuator tripped the 3.5″ stroke limit Bertelsen had set. Figure 4 shows the test assembly after the end of the fatigue cycling. It shows how the rope slipped and stretched, but the G/flex deadeye is still intact and apparently no worse for wear. This should satisfy any Coast Guard Inspector if they should ask. Bay City is proud to have the Appledore schooners to represent our city and the Great Lakes. They are owned and operated by BaySail, a private, non-profit organization dedicated to environmental education and youth development programs. BaySail funds these programs through corporate and private donations as well as public sails, private charters, group tours, and port visits. Appledore IV stays berthed in Bay City for the season. Appledore V was commissioned in 1992 by Smith and sold to the Traverse Tall Ship Co. and sailed under the name Westwind in Traverse Bay. BaySail purchased her in 2002 and changed the name back to the original Appledore V. She now is used primarily for extended cruises visiting ports all over the Great Lakes in support of the Great Lakes ecosystems. Figure 1—Traditional black locust deadeyes on the schooner Appledore IV. Deadeyes are used in pairs to tension the shrouds which hold up the mast. Figure 2—The test assembly before testing. The “experimental” two-piece deadeye is on top. Figure 3—A graphical display of sinusoidal tension fatigue. Figure 4—The test assembly after the end of the fatigue cycling. Figure 5—The Appledore IV, upbound on the Saginaw river, makes way for the downbound freighter Algoway.